In a post last week I said that I was going to start delving into hard cider, and I’ll be damned if I didn’t deliver on that promise on our trip to Portland this past weekend. I can honestly say that I probably drank more hard cider on Friday and Saturday than I had previously in my entire life put together. That probably tells you what you need to know about my inexperience with the beverage. Overall, I really enjoyed the weekend and learning more about cider. There were some I loved, and others that I didn’t; just like I’d expect from a beer fest. You can check out my pics from the weekend on Flickr. Also, this trip was partially subsidized…see full disclosure down below. Remember, I’m new to cider. Forgive me if I say something incoherent. I’d suggest checking out a site like the fine folks at Cidertimes.com if you want to hear from people much more familiar with the beverage than I. First up for the weekend was a trip to Reverend Nat’s Hard Cider’s new cider house/taproom on Friday night. 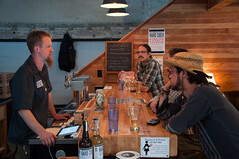 Nat West is the man behind Reverened Nat’s Hard Cider. He started this cidery out of his basement and garage back in early 2012 (I think), and quickly outgrew the space. They have now moved into a 3,500 square foot cidery in Portland’s Lloyd District, and they recently finished building out a public taproom. The taproom will allow them to pour their core ciders, as well as seasonal and specialty releases. As this was my first ever visit to a cidery, it was great to meet up with Nat, get a tour of the facilities, and talk a bit about what’s going on there. The cidery doesn’t look entirely dissimilar to a brewery, with fermenters and other equipment packed in tight. I’m obviously no expert on the technical side of making cider, so I’ll send you here if you are interested in learning more about it. The taproom has a good amount of room, and they were pouring five or six of their own ciders, as well as a beer from one of my favorite new PDX breweries, The Commons Brewery. Coming from the beer world, one of the most interesting things I learned about from Nat was the use of different yeasts for various ciders. Some ciders use just the wild yeast from the apples and environment, but traditionally it sounds like Champagne and white wine yeasts have been primarily used. But, some cideries these days, including Reverend Nat’s, are using various beer yeasts to ferment their apples and add to the flavor profile. Nat uses different strains from across the spectrum for his ciders, including one cider that is fermented with 100% lactobacillus (I didn’t get to taste it…this time). Cascadia Dry – This one was simple and refreshing. Nice apple flavor with a light sweetness. Of all the ciders I tried throughout the weekend, this is one of the few I could see myself having a couple pints of at this point. This will be distributed in 16oz cans under a separate line from Rev Nat’s called “Cascadia Ciderworkers United”. Revelation Newtown Pippin – Just had a small taste; Dry, complex and lots of flavor. Hibiscus Hymnal – made with raspberries and hibiscus. Only had a small sip of this one, but remember it being a bit too tart for my liking. Deliverance Ginger – also just had a sip of this one, but the ginger was strong and I thought a bit too abrasive. That said, the nice woman that gave me a sip of hers was loving it. Some of Nat’s ciders are available in 750ml bottles at better cider/beer retailers throughout the Seattle area, such as Full Throttle Bottles (sponsor), Bottleworks, Beer Junction, and 99 Bottles. I believe he mentioned that at some point he will be transitioning to smaller 500ml bottles. The Nat’s tasting room is a great addition to the growing cider industry in the NW, and if you are a cider drinker I’d definitely suggesting stopping by on your next visit to PDX. Nat is a hell of a nice guy who seemed eager to chat with people at the bar about what he is doing. 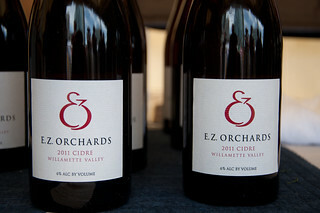 The second part of my cider adventure this weekend was attending the 3rd Annual Portland Cider Summit on Saturday at Elizabeth Caruthers Park on the waterfront south of downtown. We couldn’t have asked for a sunnier, more perfect day for an outdoor festival, and the crowds turned out well as a result. This event was a fantastic chance to try various ciders from around the country and around the world in many different styles. I enjoyed the experimental side of ciders, but similar to at beer fests there were quite a few I could not have had more than a small sample of. Red Tank Cider Company Roughneck – dry, flavorful, good apple flavor. Nothing fancy, just damn good. Virtue Cider Sidra de Nava – Spanish-style “summer cider”. Tart and flavorful…reminded me a bit of a sour beer mixed with a shandy. Outcider Pineapple Ginger – really strong on the ginger and just way out of balance. But, interesting. They had a long line for this one. Sea Cider Prohibition – used to be called Rum Runner, I believe. Aged in bourbon and rum barrels. Great flavor, but strong and sweet. Not a session cider. Hopped ciders – My favorite was Rev Nat’s Hallelujah Hopricot, but I also tried Anthem Hops and Tieton Cider Works Yakima Valley Dry Hop. Both were solid. Overall, the fest was a blast. Most booths had the cider makers on hand, and most were anxious to talk about their product and the process with newbies like myself. Cheers to the organizers for putting on a great festival, and I’ll look forward to the Seattle version on September 6 & 7! I was told by multiple people that I needed to stop by Bushwacker Cider as well, and we had plans to. But, I’d had enough cider for the day by the end of the festival. It looks like they have a fantastic selection of ciders, and I’ll definitely have to visit in the future. In case you were wondering – yes, we also drank some beer:-) We hit up the always wonderful Bailey’s on Friday night, sat on the sunny patio at Apex on Saturday, and then stopped by The Commons for a glass of their refreshing Urban Farmhouse Ale. Food? Of course. Lardo on Friday, Blue Star donuts and The Park Kitchen on Saturday, and then Tasty N Alder to finish on Sunday. We also found time to run/walk up to the Washington Park Rose Garden on Saturday (beautiful day for it) and visit both the Chinese Gardens and the PDX Library on Sunday. It was a busy, but very fun, weekend. Portland trips never disappoint, and this one was fantastic. I’ll be back in a few weeks for a friend’s bachelor party…till then. Full disclosure: A PR firm representing Reverend Nat’s funded my transportation and lodging for the weekend, and I was given tickets to attend Cider Summit by the organizers. By no means did that have any influence over my comments and thoughts in this post or any other. I’m certainly not above taking what few freebies I get for the time I put into this site, but that doesn’t mean anyone can buy a good review. I was under no obligation to post anything about my visit, nor were any demands made of me at all. All thoughts are mine, and honest. Don’t believe me? Sorry…you’ll have to trust me. You can always ignore me, though. Virtue Cider Sidra de Nava was the best new cider I had last weekend. Good call on that. Fellow beer writer who delved into exploring and covering ciders a little over a year ago. It’s too bad you didn’t make it to Bushwhacker but there’s always next visit.